When it comes to choosing kitchen worktops there are a number of materials to choose from. While natural stones such as granite still remain one of the most popular choices for kitchen worktops, in recent years Quartz kitchen worktops have become an increasingly popular contender. Engineered quartz stone provides some of the most durable and practical surfaces available. Renowned for its unique beauty, the manufacturing of quartz stone blends together approximately 93% natural quartz stone along with other granites, mirror chips, colour pigments and resins to form a totally sealed and polished surface. The specific composition, pattern and colour of the stone are all devised in the manufacturing process and can differ with different manufacturers – giving you a much wider choice in colours than other natural stones such as granite or marble, and a depth of finish that cannot be produced in other solid surface materials such as corian. 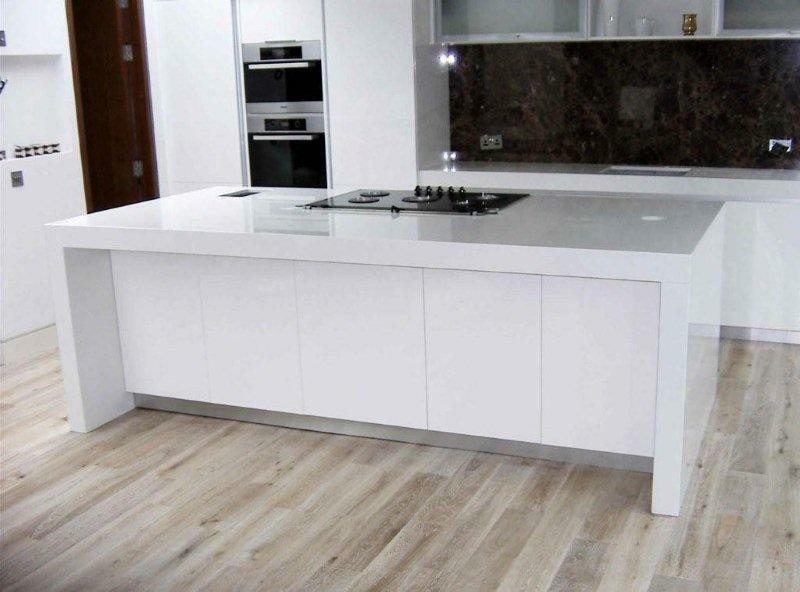 Quartz worktops are extremely hard wearing and versatile. They are highly resistant to scratching and staining, yet with the added benefit of increased flexibility, making them easier to work with when it comes to installation and edging options. They require minimal maintenance, with a simple clean using mild dish-washing soap and warm water being all that is needed to keep these worktops looking as good as new. Aside from being chip resistant, quartz kitchen worktops are also highly resistant to household acids as well as mould and mildew, making them ideal for kitchen worktops, bathroom surfaces, flooring and wall panelling. There are only a small number of drawbacks to consider when looking at quartz stone. Firstly, whilst other natural stones such as granite are highly resistant to weathering, if exposed to natural sunlight, quartz stone can start to fade in colour. It is also heavier than granite, and so would need to be installed by professionals. Secondly, seams can also be visible in quartz stone, however these will be noticeably less visible when you choose a slab that is darker in colour. However, as quartz stones have been coloured and manufactured, any seams that do occur will be easier to hide than in granite, particularly if you buy a quartz worktop in a solid colour. Finally, compared to other natural stones such as granite, quartz worktops are not as resistant to heat and so an element of caution is needed when using hot pots or pans in the kitchen.